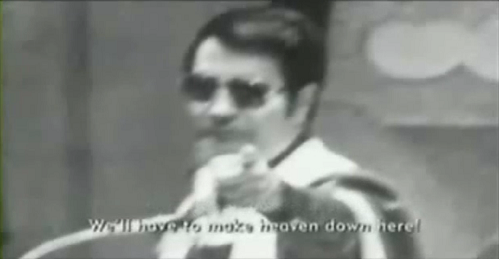 Jim Jones Cult & Similarities To The Obama Movement | Stop Obama Now!! ← Obama Eligibility Fraud Case NOT Going Away! Congressmen STILL Pursuing! There are theological similarities between the Jimmy Jones cult and Obama’s Black Liberation Theology. Both are based on self-worship, anti-Christianity and creation of a man-made utopian kingdom on earth. There is also a connection between Jim Jones and Frank Marshall Davis, via the communist sympathizer, Paul Robeson, who was the vice presidential candidate in 1948 for the Progressive Party with Henry Wallace as presidential candidate. Wallace’s presidential bid ended and the Progressive Party dissolved after a scandal which connected Henry Wallace to an occult mystical, guru in the Soviet Union. It was absorbed into the other two political parties, mainly the Democratic Party. People forget that Jim Jones was to many a well-respected community leader with much political influence right up until the time of the mass suicide. If Obama were thrown out of office, due to his abuse of power and outright crimes, would it surprise anyone, if there were a cataclysm of some kind even much greater than Jonestown. It does not necessarily have to be mass suicide, but an outbreak of violence. Video | This entry was posted in Black Cults, Cult Religion, Obama. Bookmark the permalink.